Ald Sotha (meaning "Old Sotha" in Dunmeris) was an ancient, ruined settlement located northeast of Vivec City, in the Ascadian Isles region of Vvardenfell. Originally, Ald Sotha was the seat of House Sotha, a minor house of the settled Chimer in the early First Era. It was the birthplace of Sotha Sil, who would later achieve godhood through the power of the Heart of Lorkhan and become a member of the Tribunal. 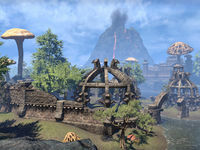 The town was destroyed by Mehrunes Dagon early in the First Era; Sotha Sil was the sole survivor, having been saved by Vivec. A shrine to Mehrunes Dagon was later built at the location, likely in remembrance of the Prince's destruction of the original city. The shrine fell into ruin, although it continued to be populated by Daedra. 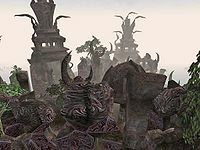 The Tribunal Temple occasionally made pilgrimages to Dagon's shrine deep within the ruins, and the Ordinators were charged with keeping away Daedra worshippers. Roland's Tear, a rare variation of the common gold kanet flower, grew only around the ruins. It was sacred to the Tribunal, and is prized by alchemists for its wondrous powers when used in potion making. By 3E 427, the Dark Brotherhood had taken over the ruins, and it became the headquarters of the Brotherhood in Vvardenfell. This attempt at expansion was viciously repelled by the native Morag Tong, the ancient enemies of the Brotherhood. The Tong infiltrated the ruins and executed the local Night Mother, Severa Magia, which helped to put an end to the Dark Brotherhood's activities on Vvardenfell. The Tong also liberated several artifacts of Sanguine from the ruins, which rightfully belonged to their patron, Mephala. The Tribunal Temple also made a pilgrimage to Dagon's shrine that year, and recovered the shoes of St. Rilms from the ruins. The ruins were likely destroyed in 4E 5, when Baar Dau crashed into Vivec City. This impact devastated the surrounding area, creating Scathing Bay, a large crater filled with boiling water from the Inner Sea. This page was last modified on 21 October 2018, at 08:00.